The Society of Italian Americans would like to thank everyone who attended, volunteered and participated in the “All You Can Eat Pasta Dinner” and silent auction held on Sunday, May 22, 2011 to help the Punelli family. Over $5,000 was raised to help this family in need. 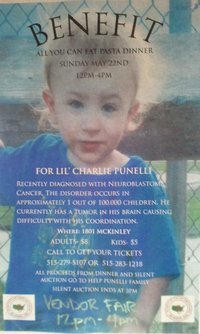 Lil’ Charlie Punelli was recently diagnosed with neuroblastoma cancer, a disorder that occurs in approximately 1 out of 100,000 children. This isn’t the first time that our club has done something to benefit the community and it surely won’t be the last. Look for more events in the near future to benefit other causes in our community. ← SIA Mourns the Loss of Long Time Member Dominic Rizzuti Sr.